CLAYMAKE STUDIO is an independently run open-access ceramic studio. We offer learning opportunities for those wishing to develop and improve skills; and use of studio space and equipment for independent makers. ​Andrea fell in love with clay when she enrolled in adult education class while on maternity leave. She went on to study Ceramics at School of Art and Design (now North Metropolitan TAFE) and was one of the last generation of students graduating with Advanced Diploma in Art and Design - Ceramics. Andrea loves teaching and working with students. 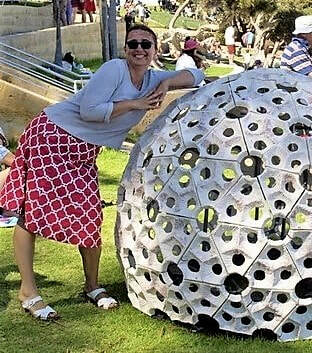 She was a ceramic technician and lecturer for over 5 years at NM Tafe (twice nominated by students for the lecturers award) and tutor at various art centres including Fremantle Art Centre. ​Emma grew up literally eating clay, learning pretty much all she knows from hanging around her mum’s studio. She grew up being ferried from exhibition openings to artist talks to critique session, and once she could carry things she was roped into helping at exhibition installs. She studied visual arts at CIT (now North Metropolitan TAFE), and is a qualified education assistant. ​It wasn’t until about two years ago that the bug bit and now she is a proper Clay Person.